Yehoshua, Please ask [and post the answers from] Rabbi Shammai shlita, in regard to this mezuza. 1. Is the revach in the word מצוך kosher, or not. May it be fixed? how? 2. 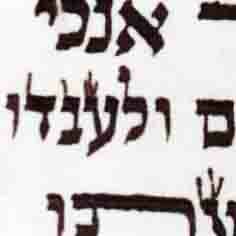 Are the 3 end lines on the left (starting U'vesherecha) pasul as a kuba? 3. Are the yuds incircled kosher or not (since their foot is much longer than their head - around twice or more. enlarge to see clearer and also when you print!) if not, may they be fixed? 4. Are the nuns incircled kosher, or they are shvura or shinuy tzura? 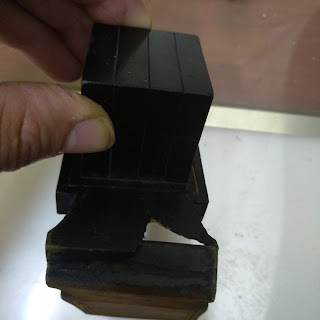 Thanks for your help, and I hope this may be help to all the forum members. In any case anybody that wants to comment before R. Shammai's comments or after, please - as Yehoshua stated in his post, one of the issues of this forum is also to learn!! I would think that the yuds are shailos tinok and could potentially be fixed. 2 of them seem like a a small lamed. The nun of eineicham seems like a complete shvura. There is no Kubah problem here, because only one shurah is sticking out. The Uvisharecha doesn't count since it needs to be indented for shiur parsha. That's the common opinion, however not everyone agrees. In R' Yerachmiel Askotzky's book "Tefillin and mezuzos" I noticed he holds contrary to what you are saying, although I do not know what this is based on as he brings no mare mekomos. This is why I was especially interested in Rav Shammai's opinion on this. I Baruch Hashem was able to show this Mezuzah to R' Shammai Gross this morning as well as a few other shailos. In regards to the Kubah. He said to me it's a maklokes R' Eliyashuv and R' Wosner. He said he first spoke to R' Eliyashuv about it 40 years ago. He's makil because (as mentioned here) that's where the word has to be for the shiur parsha. R' Wosner on the other hand is machmir. He said he paskens like R' Eliyashuv lhakil. The first Nun is kosher as is. He made a few comments also -- check the 2 zions of 'mezuzos' at the top in the picture it looks like they are touching. There was another thing he pointed out but I want to clarify again, if I get to it I will post another comment here. Yehoshua, thanks very very much. He means to marchiv the right yud of the tzadi towards the מצוך in order to minimize the gap. "All of the yudim he said are kosher" - now we learned that Rabbi Shammai doesn't hold at all from my understanding in the yud/vav problem I explained in "common problems in yudim"!! 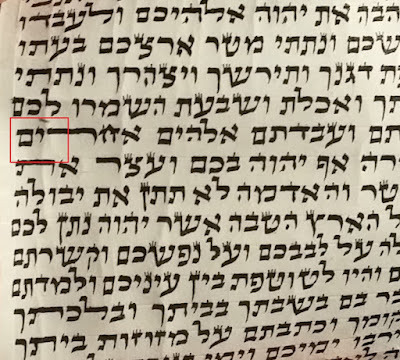 The 2 zayinim - there is a scratch in between, it is impossible for me to know what exactly the sofer/magiya scratched. I plan on bringing him the shailo of the yud posted yesterday either this evening or tomorrow -- we'll see what works out. I not only pointed out the yuds but said also that's the possible problem and pointed to as many as I could his response was rather simple that it's b'seder. I appreciate your correspondence very much. 1) kosher. if comparing space between words this is clearly less. However, should add ink as explained above. 2) In my books I write that yesh omrim the space of the shiur parsha counts. In a basic quality ksav I'd say it is fine. 3) Yifteh is the only Yud that might be a shalos tinok but I'd let it go.